At a time when the world economy is in recession, and especially here in South Africa where we already have an economy that can certainly not be seen as one of the strongest by a long shot, banks should encourage people to save and not to extend themselves too far. Yet, banks in South Africa are encouraging people to live more in credit and to become bound to those banks! This is simply irresponsible! First National Bank, one of South Africa's biggest banks, is currently having a competition, running between 15 Nov 2009 and 31 Jan 2010, through which a person can win back his weekly spend on his credit card up to a maximum amount per card category. To see how a person can win, see the graphic here below. Based on the gold card category, if I am nuts enough (there are many such nuts out there), thinking that I could possibly win a week's spending back to a value of R6000, and I keep on trying, I could soon sit with a maxed out card with say, R40000 in debt. That means I bought stuff to the value of R40000 to win back R6000 and the bank owns me! I know exactly what the bank would say. "You should know your limits! It is not our fault if you spend too much!" That is like telling a donkey not to over extend itself to get to the proverbial carrot on a stick. 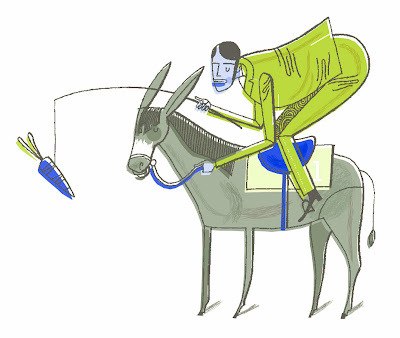 Many people are like that donkey, and while the bank holds out that carrot, the donkey will keep pursuing! Of course, FNB will not take responsibility for the donkey falling off a cliff while running after the carrot, which was held there by FNB, that was always just those few inches out of reach! FNB, and other banks should be doing more to get people to save money and not to enslave them. That is essentially what FNB is hoping for, the enslavement of their clients! People will go out and swipe those cards more and more, ensuring FNB of a much longer period of higher income. By having competitions like this one, FNB and other banks try to ensure its own long term existence without thinking what it does to the people they enslave through this unconscionable trap! The fact is that they are willing to give away R220000 while they will be making millions via people having to pay back their credit card debt! SHAME ON YOU, FNB! Posted by Unknown at Wednesday, December 16, 2009 Email post to a friend!